The objective of the present invention is to provide an exhaust gas purification device which has improved exhaust gas purification performance. An exhaust gas purification device (100) which comprises a first catalyst layer (2) that contains: a Pd-supporting catalyst which is obtained by having alumina carrier particles (22) support Pd (21); a first Rh-supporting catalyst which is obtained by having first ceria-zirconia carrier particles (23) support Rh (24); and second ceria-zirconia carrier particles (25). This exhaust gas purification device (100) is configured such that: the ceria concentration in the first ceria-zirconia carrier particles (23) is 30 wt% or less; and the amount of ceria in the second ceria-zirconia carrier particles (25) is larger than the amount of ceria in the first ceria-zirconia carrier particles (23). The present invention relates to an exhaust gas purifying apparatus. Exhaust gas generated in the combustion process of a gasoline that contains CO, HC and NO x. Three-way catalyst is known as exhaust gas purifying apparatus for purifying these three kinds of exhaust gas purifying component. The three-way catalyst has a base material, onto the substrate Rh, Pt, a structure in which a noble metal such as Pd, comprising a catalyst coating layer supported on a carrier particle, of these noble metals, for example, Rh is mainly reduction of NO x, Pt and Pd is mainly responsible for oxidizing HC and CO. In this regard, Patent Document 1, an alumina carrier particles carrying Pd, ceria supporting Pt and / or Rh - exhaust gas purifying apparatus is disclosed which has a catalyst layer containing a zirconia support particles onto a substrate . In Patent Document 1, by supporting Pd on alumina support particles having excellent heat resistance, and suppress grain growth of Pd, it is possible to maintain a high catalytic activity, ceria - oxygen in the atmosphere by ceria zirconia support particles it is possible to adjust the concentration. Thus the reduction reaction of NO x, as well as to improve the oxidation reaction of CO and HC, have reported that it is possible to improve the exhaust gas purification performance. The present invention aims to provide an exhaust gas purifying apparatus having an improved exhaust gas purification performance. The present inventors have found that the following means has been found that it is possible to solve the above problems. Said first ceria - ceria concentration of the zirconia support particles is not more than 30 wt%, and the second ceria - ceria amount the first ceria zirconia support particles - than ceria amount of zirconia support particles large, the exhaust gas purifying apparatus. Said second ceria - ceria concentration of the zirconia support particles, greater than 30 wt%, the exhaust gas purifying apparatus according to embodiment 1. It said first catalyst layer further comprises a barium sulfate, an exhaust gas purifying apparatus according to embodiment 1 or 2. The first having a second catalyst layer on the lower side of the catalyst layer, the exhaust gas purifying apparatus according to any one of Aspects 1-3. The second catalyst layer comprises a barium sulfate, an exhaust gas purifying apparatus according to embodiment 4. Said second catalyst layer, a first ceria - including second Rh supported catalyst obtained by supporting Rh on zirconia support particles, the exhaust gas purifying apparatus according to aspect 4 or 5. Wherein the amount of Rh in the first Rh supported catalyst, the ratio of the amount of Rh in the second Rh supported catalyst, 10: 90-90: 10 in the range of, the exhaust gas purifying apparatus according to embodiment 6. Wherein a second additional one or more layers below the catalyst layer, the exhaust gas purifying apparatus according to any one of embodiments 4-7. Said first catalyst layer is present on the substrate, the exhaust gas purifying apparatus according to any one of Aspects 1-3. The first having the second catalyst layer between the catalyst layer and the base material, the exhaust gas purifying apparatus according to any one of embodiments 4-7. Having said one or more layers between the substrate and the second catalyst layer, the exhaust gas purifying apparatus according to embodiment 8. According to the present invention, it is possible to provide an exhaust gas purifying apparatus having an improved exhaust gas purification performance. (A) it is a conceptual view of the exhaust gas purifying apparatus according to one embodiment of the present invention. (B) it is a conceptual view of the exhaust gas purifying system according to still another one embodiment of the present invention. (C) it is a conceptual view of the exhaust gas purifying apparatus of the prior art. One embodiment of the exhaust gas purifying apparatus of the present invention is a conceptual diagram showing. Exhaust gas purifying apparatus of the present invention, the Pd-supported catalyst obtained by supporting Pd on alumina support particles, a first ceria - first and Rh supported catalyst obtained by supporting Rh on zirconia support particles, a second ceria - having a first catalyst layer containing a zirconia support particles, an exhaust gas purifying apparatus, a first ceria - ceria content in the zirconia support particles is not more than 30 wt%, and the second ceria - zirconia support particles ceria amount first ceria in - greater than ceria amount of the zirconia support particles, an exhaust gas purifying apparatus. For example, as shown in FIG. 1 (a), the exhaust gas purifying apparatus of the present invention (100) comprises a Pd-supported catalyst obtained by carrying Pd (21) to the alumina carrier particles (22), a first ceria - zirconia first and Rh supported catalyst obtained by carrying Rh (24) to the carrier particles (23), a second ceria - having first catalyst layer containing a zirconia support particles (25) to (2), the exhaust gas purifying it is a device (100). Further, as shown in FIG. 1 (b), the first catalyst layer (2) may be present on the substrate (1). In Patent Document 1, as shown in FIG. 1 (c), and Pd supported catalyst obtained by carrying Pd (21) to the alumina carrier particles (22), ceria - zirconia support particles (26) Rh (24) catalyst layer comprising a Rh-loaded catalyst obtained by carrying exhaust gas purifying apparatus having a (2) on a substrate (1) (100) is disclosed. According to Patent Document 1, by the effect of the alumina support particles having excellent heat resistance (22), to suppress the grain growth of the Pd (21), high with catalytic activity can be maintained, ceria - zirconia support particles (26) in by adjusting the oxygen concentration in the atmosphere by the ceria it has been possible to improve the exhaust gas purification performance. Apparatus for purifying an exhaust gas of the publication (100), ceria was supported Rh (24) - zirconia carrier particles (26), it contains many ceria course. However, it, Rh (24) ceria carrying - as the amount of ceria contained in the zirconia support particles (26) is large, the exhaust gas purifying performance is deteriorated due to Rh, resulting in the exhaust gas purifying apparatus ( exhaust gas purification performance of 100) found that there is a tendency to decrease gradually. Therefore, from such point of view, the present inventors, as shown in FIG. 1 (a) and (b), the first ceria containing ceria at low concentrations - in the zirconia support particles (23) Rh ( with supporting the 24), to ensure the oxygen storage capacity (OSC performance), a second ceria - zirconia carrier particles (25) were added. Thus, Rh prevents reduction in the activity of Rh by ceria contained in the carrier particles carrying the, and it is possible to secure the OSC performance, the exhaust gas purifying apparatus of the present invention, improves the exhaust gas purification performance it can be. Incidentally, apparatus for purifying an exhaust gas of the present invention (100) is carried as shown in FIG. 1 (a) and (b), carriers are still carrying the other noble metals such as Pd (21) it may have an alumina (22). The device for purifying an exhaust gas of the present invention (100) is below the first catalyst layer (2) may have a second catalyst layer (3), further a third catalyst layer ( 4) may have, or may have an additional catalyst layer. Here, the "upper" or "lower" is determined based on the relationship in a case where the exhaust gas flow is considered as the most upper parts in contact. For example, the exhaust gas purifying device having a substrate, the substrate is located below the catalyst layer. Furthermore, the exhaust gas purifying apparatus of the present invention (100), as shown in FIG. 2 (a), between the substrate (1) and the first catalyst layer (2), the second catalyst layer (3 ) may have, as shown in FIG. 2 (b), may have further third catalyst layer (4), may have an additional catalyst layer. The second catalyst layer (3), for example, carrying Rh, and low density ceria containing ceria - may be present zirconia support particles and alumina particles, the third catalyst layer (4) the, for example, a carrier carrying Pt and / or Pd may be present. The first catalyst layer, and the Pd-supported catalyst obtained by supporting Pd on alumina support particles, a first ceria - a first Rh supported catalyst obtained by supporting Rh on zirconia support particles, a second ceria - and a zirconia support particles. The first catalyst layer, a substrate comprising a catalyst support particles to the wall surface, may be part of such substrates as described, for example, in JP-2015-85241, present on such substrates it may be in. If the first catalyst layer is part of the substrate, the first catalyst layer may constitute a wall surface of a substrate. In this case, Pd-supported catalyst, the first Rh supported catalyst, and a second ceria - zirconia support particles, used in a mixture with inorganic particles used in preparing the substrate, obtaining an exhaust gas purifying device it may be. Pd supported catalyst of the present invention is a catalyst Pd is supported on an alumina support particles. Pd is superior in low-temperature activity, mainly serves to oxidize HC and CO. Using the exhaust gas purifying apparatus of the present invention containing Pd in ​​the first catalyst layer, even at low temperatures such as immediately after the beginning of startup of the internal combustion engine, it is possible to efficiently purify the exhaust gas. Moreover, alumina, because it is an oxide having excellent heat resistance, by supporting Pd on alumina support particles, thereby suppressing the sintering of Pd, it is possible to prevent the decrease in activity. As the alumina carrier particles, .gamma.-alumina, beta-alumina, and silica - may be selected from alumina or the like. Of these adsorption properties and excellent heat resistance γ- alumina are particularly preferably used. The specific surface area of the alumina support particles carrying properties, heat resistance, from the viewpoint of structural stability, for example 30 m 2 / g or more, 50 m 2 / g or more, 100 m 2 / g or more, 150 meters 2 / g or more or 200 meters 2 / it can be used g or more of, 2000 m 2 / g or less, 1000 m 2 / g or less, 800 m 2 / g or less, 500 meters 2 / g or less, or 400 meters 2 / g or less of those can be used. Other porous carrier may be used in addition to the alumina support particles. Other porous support, catalytic metal can be mentioned heat-resistant inorganic oxides which are generally used to carry a can be, for example, silica, zirconia, titania. Loading amount of Pd is more than 0.5g per substrate or exhaust gas purifying device 1 liter or more 1 g, 3 g or more, or may be more than 5 g, 10 g or less, 9g or less, 8g or less, or 7g or less . Pd is sometimes purification rate of CO and HC is less than this range is reduced, leading to increase in cost along with effective even if more than this range supported is saturated. Pd supported catalyst of the present invention can be obtained, for example, by the following steps. Water dispersing the alumina carrier particles to prepare a dispersion. Further adding an aqueous solution containing a Pd salt to the dispersion, thoroughly mixing, drying by subsequent firing, it is possible to obtain a Pd-supported catalyst Pd is supported on an alumina support particles. The Pd salt can be used here, palladium nitrate, and a soluble salt in water, such as palladium chloride. In the preparation method of the Pd supported catalyst, the drying temperature is, for example, 70 ° C. or higher, 80 ° C. or higher, or may be at 90 ° C. or higher, 0.99 ° C. or less, 120 ° C. or less, 110 ° C. or less, or a at 100 ° C. or less good. The firing temperature is, for example, 300 ° C. or higher, 400 ° C. or higher, or may also be 500 ° C. or higher, 1500 ° C. or less, 1300 ° C. or less, or 1100 ° C. may be less. Firing time is 1 hour or more, 2 hours or more, or may be four hours or more, 10 hours or less, or may be not more than 8 hours. First Rh supported catalyst of the present invention, a first ceria - a catalyst Rh is supported on zirconia support particles. Rh serves to primarily reducing the NOx. First ceria - zirconia support particles is a material showing the OSC performance, particularly by loading a noble metal such as Rh, are known to exhibit extremely excellent OSC performance. Using the exhaust gas purifying apparatus of the present invention containing Rh supported catalyst in the first catalyst layer, it is possible to purify the exhaust gas efficiently. The first ceria - The zirconia composite oxide is that of the composite oxide in the state in which the ceria and zirconia solid solution, may contain an alkaline earth metal element or a rare earth element (excluding Ce and Zr) at the same time it can. Examples of the alkaline earth metal elements, beryllium (Be), magnesium (Mg), calcium (Ca), strontium (Sr), barium (Ba) and the like. As the rare earth element (excluding Ce and Zr), scandium (Sc), yttrium (Y), lanthanum (La), praseodymium (Pr), neodymium (Nd), promethium (Pm), and the like. The present inventors have, first ceria carrying the Rh - when ceria amount of zirconia composite oxide is high, the exhaust gas purification performance rather found that reduction. Therefore, from such point of view, the first ceria - ceria concentration of zirconia support particles is low, specifically, 30 wt% or less, 25 wt% or less, 20 wt% or less, 15 wt% or less, 10 wt%, or 5wt % or less. First ceria - zirconia support particles can be prepared, for example, by a coprecipitation method. Coprecipitation method, as a predetermined stoichiometric ratio, Ce, Zr, and depending solution of a salt containing an alkaline earth metal element or a rare earth element (excluding Ce and Zr) were prepared as required, the neutralizing agent was added to this solution, Ce, Zr, after co-precipitated salt containing an alkaline earth metal elements and rare earth elements (excluding Ce and Zr) optionally, the co-precipitate, for example 400 first ceria by heat treatment at ~ 1000 ° C. - can be prepared zirconia support particles. Examples of the salts of the respective elements, for example, sulfates, nitrates, chlorides, inorganic salts such as phosphates, for example, acetates, and organic salts such as oxalate salts. As the neutralizing agent, such as ammonia, for example, triethylamine, organic bases such as amines such as pyridine, for example, sodium hydroxide, potassium hydroxide, sodium carbonate, potassium carbonate, ammonium carbonate, such as ammonium hydroxide inorganic bases. As a neutralizing agent, preferably, include hydroxide salts, more preferable example is aqueous ammonium hydroxide. Incidentally, the neutralizing agent is added so that the pH of the solution after the addition of neutralizing agent is 6 to 10, for example. Loading amount of Rh is the substrate or an exhaust gas purification device 1 liter 0.01g or more, or more 0.02 g, or 0.05 g, more than 0.1 g, or may be more than 0.5 g, 5 g or less, 4g or less , 3g hereinafter, 2 g or less, or 1g or less. Rh is may reduce less the NOx purification rate than this range, leading to increase in cost along with effects be more supported than this range is saturated. First Rh supported catalyst of the present invention can be obtained by the same process as the Pd supported catalyst. First ceria - is low ceria concentration of the zirconia support particles, in the configuration of the Pd supported catalyst and supported Rh catalyst only, the lack of OSC performance, problems exhaust gas purification performance is deteriorated occurs. Therefore, to ensure the OSC performance, a second ceria - adding zirconia support particles in the first catalyst layer. For example, the second ceria not carrying a noble metal - can be used zirconia support particles. Second ceria - zirconia support particles, first ceria - may have the same configuration as a zirconia support particles can be prepared in a similar manner (e.g., co-precipitation method). However, the second ceria - zirconia support particles, because in order to secure the deficient OSC performance is intended to be added to the first catalyst layer, a second ceria - ceria concentration of zirconia support particles is higher it is preferred, for example, 30 wt% greater than, 40 wt% or more, 50 wt% or more, or may be at 60 wt% or more, less 95 wt%, 90 wt% or less, 80 wt% or less, or less 70 wt%. The first ceria carrying the Rh - zirconia while suppressing the ceria content in the carrier particles, from the viewpoint of securing the ceria amount of the entire first catalyst layer, a second ceria - zirconia support particles the amount of ceria, first ceria - greater than ceria amount of zirconia support particles. For example, a first ceria - ceria amount of the zirconia support particles, a second ceria - the ratio of the ceria amount of zirconia support particles is 45: 55-40: 60, 40: 60-30: 70,30 : 70-20: 80 and 20 80 and 10 90 or 10:90 to 5: it may be 95. The first catalyst layer, in order to improve the further exhaust gas purification performance, Pd supported catalyst, Rh supported catalyst, and the second ceria - the zirconia support particles comprise one or more co-catalyst component having a different composition It can have. For example, the first catalyst layer, barium, calcium, cesium, potassium, magnesium, and at least one element selected from the group consisting of lanthanum nitrate, may be included in the acetate or nitrate form, in particular it can be included barium sulfate (BaSO 4). Thus, the HC and the like contained in the exhaust gas, Pd can be prevented from being poisoned, it is possible to improve the exhaust gas purification performance. The substrate can be generally used any material used in the exhaust gas purifying apparatus is not particularly limited. Specifically, as the substrate, it is possible to use a material of honeycomb shape having a plurality of cells, for example, cordierite (2MgO · 2Al 2 O 3 · 5SiO 2), alumina, zirconia, silicon carbide, etc. can be used or ceramic material having heat resistance, a metal material made of a metal foil such as stainless steel. As described above, the first catalyst layer, a substrate comprising a catalyst support particles to the wall surface, may be part of such substrates as described, for example, in JP-2015-85241. The second catalyst layer is a catalyst layer of the first lower may be present on the side optional catalyst layer. The second catalyst layer, a substrate comprising a catalyst support particles to the wall surface, for example, JP be part of such substrates as described in 2015-85241 JP, such that the second catalyst layer it may constitute a wall surface of the substrate. In this case, the first catalyst layer may be present on the second substrate is a catalyst layer. When the second catalyst layer is part of the substrate, a Rh supported catalyst, used in a mixture with inorganic particles used in making the substrate may be obtained an exhaust gas purifying device , and the second catalyst layer, ceria - like catalyst support particles to the substrate containing the wall surface of the zirconia may be one obtained by supporting Rh by wash-coating method. The second catalyst layer may be a component similar to the first catalyst layer, and the Pd-supported catalyst obtained by supporting Pd on alumina support particles, the first ceria - Rh was supported on zirconia support particles a second Rh supported catalysts comprising Te, a second ceria - can include a zirconia support particles. Other similarly above cocatalyst component and the first catalyst layer may also include, one or more. By reducing the total amount of noble metal contained in the exhaust gas purifying apparatus of the present invention, in order to reduce raw material costs, the second catalyst layer, Pd-supported catalyst, and a second ceria - may not include zirconia support particles preferable. Purification of HC and CO, and OSC performance is because they are sufficiently secured by the first catalyst layer. On the other hand, the reduction of NOx is, because they are made by multi-step reaction, requires a lot of adsorption reaction field in the catalyst layer. Therefore, the second catalyst layer preferably comprises a second Rh supported catalysts. Second Rh-loaded catalyst may be substantially identical to the first Rh supported catalyst, first ceria - may be a catalyst obtained by supporting Rh on zirconia support particles. And Rh amount of the first Rh supported catalyst, the ratio of the amount of Rh in the second Rh supported catalyst is from 10: 90-90: 10, 10: 90-20: 80 and 20: 80-30: 70,30 : 70-40: 60, 40: 60-50: 50, 50: 50-60: 40 and 60: 40-70: 30, 70: 30-80: 20, or 80: 20-90: a 10 well, preferably the amount of Rh in the first Rh supported catalyst, the ratio of the amount of Rh in the second Rh supported catalyst, 50: 50-60: 40 and 60: 40-70: 30, 70: 30-80 : 20, or 80: 20 to 90:10. Other exhaust gas purifying apparatus of the present invention may have one or more catalyst layers further down side of the second catalyst layer. Exhaust gas purifying apparatus of the above-described structure can be manufactured by a conventional manufacturing process similar. For example, when the first catalyst layer as shown in FIG. 1 (a) constitutes a part of the wall of the substrate, Pd supported catalyst, first Rh supported catalyst, and a second ceria - zirconia support particles and used as a mixture with inorganic particles used in making the substrate may be obtained an exhaust gas purifying device. To produce the single-layer structure type of exhaust gas purifying apparatus having only the first catalyst layer on the substrate as shown in FIG. 1 (b) for example, first Pd supported catalyst, Rh supported catalyst, and a second ceria - coating the substrate a slurry containing zirconia support powder by a known wash-coating method or the like. Then dried at a predetermined temperature and time, by baking, it is possible to manufacture the exhaust gas purifying apparatus having a first catalyst layer on the substrate. Also has first and second catalyst layers, in manufacturing the exhaust gas purifying apparatus of the two-layer structure type, the second catalyst layer is formed on first substrate or as a second catalyst layer substrate comprising a catalyst support particles to the wall surface, for example, JP using substrates as described in 2015-85241 JP, then it is preferable to form the first catalytic layer. Specifically, in the case of the embodiment of FIG. 1 (b), the desired component for the second catalyst layer, used in a mixture with other inorganic particles to be used in preparing the substrate, the second catalyst layer to obtain a substrate which is a part of. Thereafter, a slurry for the first catalyst layer was coated on the substrate by known wash-coating method or the like, dried and fired. Further, in the case of the embodiment of FIG. 1 (b) is coated on the surface of the substrate by a known wash-coating method a slurry for the second catalyst layer containing the desired components. Then, Pd-supported catalyst, Rh supported catalyst, and a second ceria - laminated coated on the surface of the second catalyst layer by the first catalyst layer slurry known wash-coating method or the like comprising a zirconia support powder. Then, it dried at a predetermined temperature and time, calcined. Laminated structure may be more than three layers is not limited to two layers. Or such instead of once firing process, a slurry for the second catalyst layer to form a first second catalyst layer was dried and calcined after coated on the surface of the substrate, then the first catalyst or a process of performing sintering of the two-stage forming the first catalyst layer by performing a surface coating to drying and baking of the layer slurry second catalyst layer. The firing conditions of the washcoat slurry is not particularly limited, and typically at about 400 ~ 1000 ° C., by performing firing of about 1 to 4 hours, it is possible to form the catalyst layer of the object . Although there is no particular limitation on the drying conditions prior to firing, the preferred drying of about 1 to 12 hours at a temperature of 80 ~ 300 ° C.. In the case of forming a catalyst layer by such wash-coat method, the surface of the substrate, further in the case of a multiple layered structure catalyst layer in order to suitably contact the slurry below the surface, the slurry containing a binder it is preferable. As the binder for such purposes, for example an alumina sol, the use of silica sol or the like. The viscosity of the slurry may slurry is easily appropriately adjusted so as to flow into the cell of the substrate (e.g. honeycomb substrate). Hereinafter, a detailed explanation of the present invention by way of example, the technical scope of the present invention is not intended to be limiting. "Preparation of the exhaust gas purifying apparatus of the one-layer configuration"
First ceria ion-exchanged water 100 ml - zirconia (CZ) composite oxide (CeO 2 / ZrO 2 / La 2 O 3 / Nd 2 O 3 = 20/70/5/5 (wt%)) and (CZLN1 notation) (25 g), and 5 wt% as a rhodium nitrate solution (Rh element) to (4g) was charged and stirred for 60 minutes. After drying at 110 ° C., and calcined 1 hour at 500 ° C. in air to obtain a Rh-supporting powder I. Then, alumina ion-exchanged water 200 ml (50 g), and (5 wt% as Pd element) palladium nitrate solution (20 g) was charged and stirred for 60 minutes. After drying at 110 ° C., and calcined 1 hour at 500 ° C. in air to obtain a Pd-carried alumina I.
Pd on Alumina I (51 g) (among Pd amount of element 1 g), Rh-supported powder I (25.2 g) (amount of out Rh element 0.2 g), and a second ceria - zirconia (CZ) composite oxide (CeO 2 / ZrO 2 / La 2 O 3 = 40/55/5 (wt%)) (CZL1 denoted) (25 g) and was mixed to prepare a slurry. The slurry (the amount of amount of 1 g, Rh element among Pd element 0.2 g) 100.2 g monolith honeycomb substrate (total length 100mm volume 1.0L cell number 900 cells / in2) coated, 1 250 ° C. after drying time, and calcined 1 hour at 500 ° C., to prepare an exhaust gas purifying apparatus of example 1. Change the type of the first CZ-based composite oxide, and change the amount of alumina, and except for not using the second CZ-based composite oxide, in the same manner as in Example 1, Example 2 gas thereby obtaining a purifying apparatus. "Study of Preparation -Rh carrier of exhaust gas purifying apparatus of the two-layered structure"
In the same manner as the Rh-supported powder I the amount of supported Rh except that the 0.18 g, was obtained Rh-supported powder II. Rh supported powder II (25.18g) (amount of out Rh element 0.18 g), and mixed alumina (75 g) to prepare a slurry. After the slurry 100.1g monolith honeycomb substrate (total length 100mm volume 1.0L cell number 900 cells / in 2) (the amount of out Rh element 0.1 g) was coated, dried for 1 hour at 250 ° C., and calcined 1 hour at 500 ° C., to prepare an exhaust gas purifying apparatus having a first catalyst layer. In the same manner as the Rh-supported powder I except that the amount of supported Rh to 0.02 g, to obtain a Rh-supporting powder III. Example Pd loaded alumina I used in 1 (51 g) (amount of out Pd element 1 g), Rh-supported powder III (25.02 g) (amount of out Rh element 0.02 g), and ceria - zirconia composite oxide things CZL1 mixture was slurry (25 g) was prepared. The slurry 101.12g exhaust gas purification device having a first catalyst layer of the (amount of out Pd element 1g, the amount of Rh element 0.0.02G) coated and dried 1 hour at 250 ° C. after, and then calcined 1 hour at 500 ° C., and the exhaust gas purifying apparatus of example 3 having a first and second catalyst layers were prepared. Without total change amount of supported Rh, the first catalyst layer and the same method as in Example 3 except for changing the Rh-supporting ratio in the second catalyst layer, the structure described in Table 1 below example 4 was obtained exhaust gas purifying apparatus of 1-7. Further, without supporting Rh in the first catalyst layer, except for changing the amount of supported Rh of the second catalyst layer in the same manner as in Example 3 to obtain the exhaust gas purifying apparatus of Example 8. 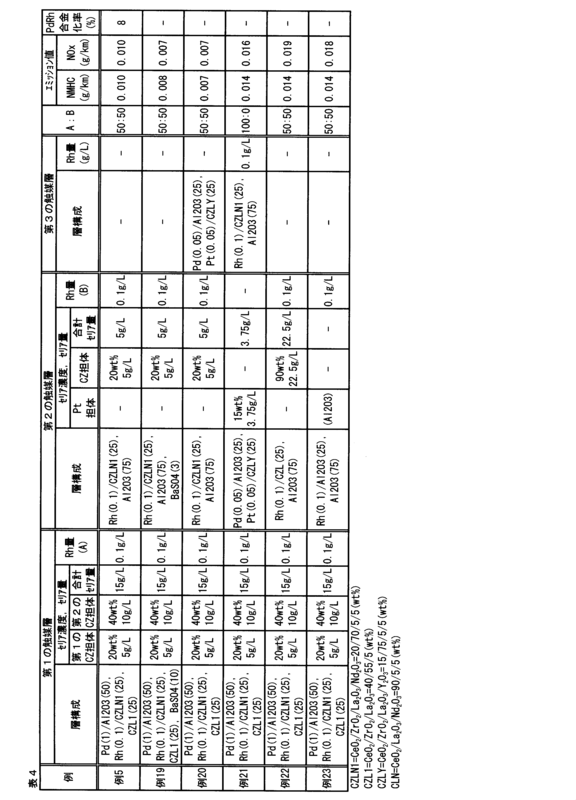 "Preparation of the exhaust gas purifying apparatus of the two-layer structure - Study of the type of the first CZ-based composite oxide"
In a similar manner to Example 5 except for changing the kind of first CZ-based composite oxide to obtain the exhaust gas purifying apparatus of Example 9-14 are configured as described in Table 2 below. "Preparation of the exhaust gas purifying apparatus of the two-layer structure - Study of the type of the second CZ-based composite oxide"
In a similar manner to Example 5 except for changing the kind of second CZ-based composite oxide of the first catalyst layer to obtain the exhaust gas purifying apparatus of the configuration in Example 15-17 described in Table 3 below . In Example 18, it did not use the second CZ-based composite oxide of the first catalyst layer. "Preparation of the exhaust gas purifying apparatus of the two-layer structure - Study of barium sulfate"
Example 5 The same method to obtain the exhaust gas purifying apparatus of Example 19 as described in Table 4 below. "Preparation of the exhaust gas purifying apparatus having a three-layer structure"
(1) alumina in ion-exchanged water 100 ml (25 g), and (5 wt% as Pd element) palladium nitrate solution (1 g) was charged and stirred for 60 minutes. After drying at 110 ° C., and calcined 1 hour at 500 ° C. in air to obtain a Pd-carried alumina II. (2) ceria ion-exchanged water 100 ml - zirconia composite oxide (ZrO 2 / CeO 2 / La 2 O 3 / Y 2 O 3 = 75/15/5/5 (wt%)) (CZLY hereinafter) ( 25 g), and dinitrodiammine Pt nitrate solution (5 wt% as Pt) to (1 g) was charged and stirred for 60 minutes. After drying at 110 ° C., and calcined 1 hour at 500 ° C. in air to obtain a Pt-supported CZ carrier. (3) Pd on alumina II (25.05 g) (amount of out Pd element 0.05 g), and Pt-supported CZ carrier (25.05 g) (amount of out Pt elements 0.05 g) were mixed slurry It was prepared. The slurry (the amount of amount of 0.05 g, Pt elements among Pd element 0.05 g) 50.1 g monolith honeycomb substrate (total length 100mm volume 1.0L cell number 900 cells / in 2) was coated, 250 after drying for 1 hour at ° C., and calcined 1 hour at 500 ° C., to prepare an exhaust gas purifying apparatus having a first catalyst layer. (4) Rh supported powder I (25.1 g) used in Example 1 (amount of out Rh element 0.1 g), and mixed alumina (75 g) to prepare a slurry. After this 100.1g the exhaust gas purifying apparatus resulting slurry (3) (the amount of out Rh element 0.1 g) was coated, dried for 1 hour at 250 ° C., and calcined 1 hour at 500 ° C., the to obtain the exhaust gas purifying apparatus having the first and second catalyst layers. (5) Then, alumina ion-exchanged water 200 ml (50 g), and (5 wt% as Pd element) palladium nitrate solution (20 g) was charged and stirred for 60 minutes. After drying at 110 ° C., and calcined 1 hour at 500 ° C. in air to obtain a Pd-carried alumina III. (6) Pd-supported alumina III (51 g) (among Pd amount of element 1 g), Rh-supported powder I (25.1 g) (amount of out Rh element 0.1 g), and ceria - zirconia composite oxide CZL1 (25 g) was mixed to prepare a slurry. After this slurry 101.1g exhaust gas purification device obtained in (4) (the amount of out Pd element 1g, the amount of Rh element 0.1 g) was coated, dried for 1 hour at 250 ° C., at 500 ° C. and calcined for 1 hour to obtain an exhaust gas purifying apparatus of example 20. Changing the configuration of the second catalyst layer and the third catalyst layer, in the same manner as in Example 20 to obtain the exhaust gas purifying apparatus of Example 21 of the configuration described in Table 4 below. "Preparation of the exhaust gas purifying apparatus of the two-layer structure - changes CZ carrier of the second catalyst layer"
In a similar manner to Example 5 except for changing the CZ carrier of the second catalyst layer to obtain the exhaust gas purifying apparatus of the configuration in Example 22-23 described in Table 4 below. For exhaust gas purifying device, a durability test was carried out of 80,000 km mileage equivalent. Thereafter, equipped with these exhaust gas purifying apparatus in actual vehicle having an engine of 1.0 L, traveling at JC08 mode, NMHC, it was measured emissions of NOx. The results are shown in Table 1. The values ​​of Table 1 are combined value of Cold evaluation and Hot Evaluation of JC08 mode. Example 2 and scraped durability exhaust gas purifying apparatus of Example 5, were measured characteristic X-ray intensities of Pd and Rh contained in the device by a scanning electron microscope (SEM-EDX). In this measurement, it was observed at 150,000-fold magnification. Measurements of Pd element "Pd", in the case where the measured values ​​of Rh elements as "Rh", was calculated Pd-Rh alloy rate by the following equation. Repeat SEM-EDX measurement of the Pd and Rh, carried out 100 points analysis to determine the average value of the Pd-Rh alloy ratio as a representative value. 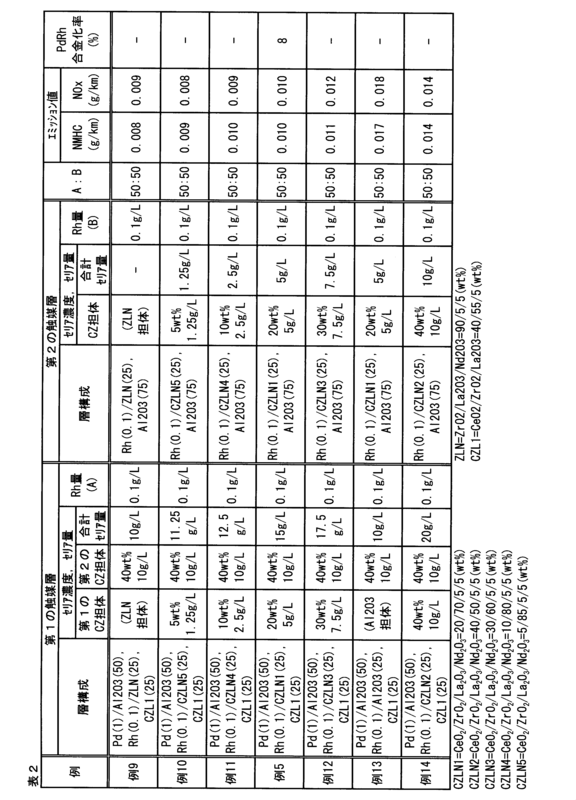 The results are shown in Tables 1 to 4. As can be seen from Table 1, the first ceria - high ceria concentration of the zirconia support particles, and as compared with Example 2 ceria amount often contain, first ceria - low ceria concentration of zirconia support particles to, and with less ceria content contained, second ceria - example 1 was added zirconia carrier particles were improved exhaust gas purification performance. In comparison with Example 1 having only the first catalyst layer, having Rh supported catalyst in the first and second catalyst layers, the two-layer example of the structure 3-7, exhaust gas purification performance is further It was improved. Also, albeit in two-layer structure, the first catalyst layer as compared with Example 8 having no Rh supported catalysts, Examples 3-7 having Rh supported catalyst in the first and second catalyst layers In, improved exhaust gas purification performance. 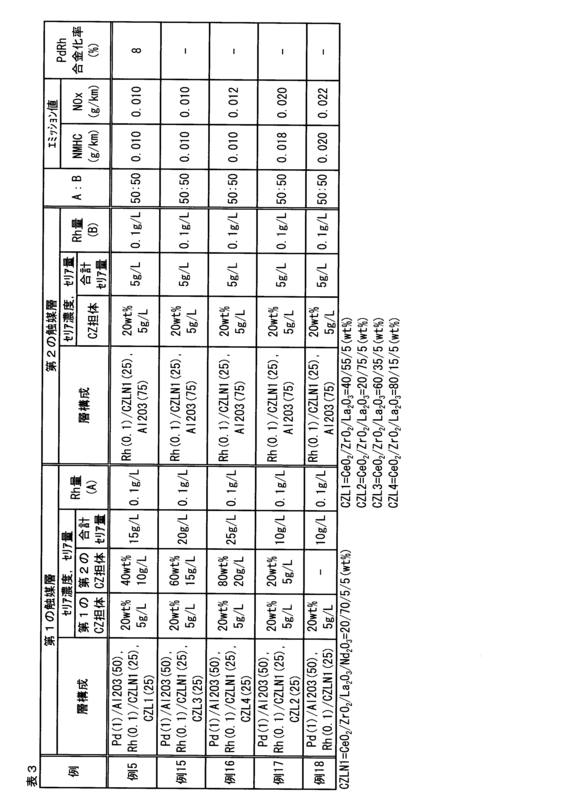 Moreover, as can be seen from Table 2, compared to Example 13 which was supported Rh on alumina, Rh first ceria - Example 5 was carried on zirconia support particles, and improved exhaust gas purification performance. The first ceria - as compared to the ceria concentration higher Example 14 zirconia support particles, a first ceria - the zirconia support particles ceria concentration is low Example 5 and Examples 9 to in 12, the exhaust gas purification performance It has improved, and the first ceria - exhaust gas purification performance is improved lower the ceria concentration of zirconia support particles. Moreover, as can be seen from Table 3, in the first catalyst layer, a first ceria - compared to Example 17 is ceria content in the zirconia support particles are the same - zirconia support particles ceria amount and the second ceria in Te, a second ceria - ceria amount of the zirconia support particles are first ceria - greater than ceria amount of the zirconia support particles, example 5 and examples 15-16, the exhaust gas purifying performance is improved. The second ceria in the first catalyst layer - as compared to Example 18 containing no zirconia support particles, a second ceria - Example 5 containing zirconia support particles, and improved exhaust gas purification performance. 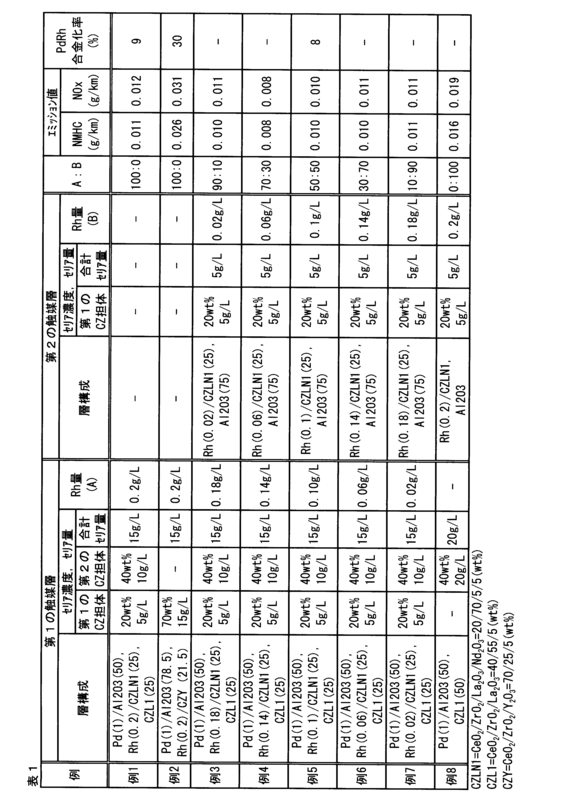 Table As can be seen from 4, as compared with Example 5 containing no barium sulfate, Example 19 containing barium sulfate and further improved exhaust gas purification performance. In comparison with Example 5 having a two-layer structure, in Example 20 having a three-layer structure was further improved exhaust gas purification performance. Further, in the second catalyst layer, as compared with Example 23 that supports Rh on alumina support particles, the Rh first ceria - Example carries the zirconia support particles 5 and 22, the exhaust gas purifying performance There was further improved. It said second ceria - ceria concentration of the zirconia support particles, greater than 30 wt%, the exhaust gas purifying apparatus according to claim 1. It said first catalyst layer further comprises a barium sulfate, an exhaust gas purifying apparatus according to claim 1 or 2. A second catalyst layer on the lower side of the first catalyst layer, the exhaust gas purifying apparatus according to any one of claims 1-3. The second catalyst layer comprises a barium sulfate, an exhaust gas purifying apparatus according to claim 4. Said second catalyst layer, a first ceria - including second Rh supported catalyst obtained by supporting Rh on zirconia support particles, the exhaust gas purifying apparatus according to claim 4 or 5. Wherein the amount of Rh in the first Rh supported catalyst, the ratio of the amount of Rh in the second Rh supported catalyst, 10: 90-90: 10 in the range of, the exhaust gas purifying apparatus according to claim 6. Wherein a second additional one or more layers below the catalyst layer, the exhaust gas purifying apparatus according to any one of claims 4-7. Said first catalyst layer is present on the substrate, the exhaust gas purifying apparatus according to any one of claims 1-3. Having the second catalyst layer between the substrate and the first catalyst layer, the exhaust gas purifying apparatus according to any one of claims 4-7. Having said one or more layers between the substrate and the second catalyst layer, the exhaust gas purifying apparatus according to claim 8.